The 20th Century Limited was the most famous of the named passenger trains operated by the New York Central Railroad. It traveled between New York’s Grand Central Station and Chicago’s LaSalle Street Station from 1902 to 1967. In its peak year, 1928, the 20th Century earned revenue of $10 million, making it possibly the most profitable train globally. On its inaugural run, June 17, 1902, the journey between New York and Chicago was completed in twenty hours, four less than previously. Speed was assisted by making fewer stops (four) and using track pans to take on water for steam production. Later, the time was reduced to 15 ½ hours with the introduction of lighter cars. This train was best known for its streamlined Art Deco design. Henry Dreyfuss was commissioned in 1938 to design what became the most famous American passenger train. Tones of blue and grey were used on both locomotive and passenger cars. 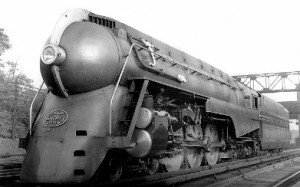 The locomotive was clad in sheathing to give it a streamlined appearance, with a “bullet” nose and the running gear exposed. The train’s dining cars became a nightclub called Café Century. The New York Central made use of special red carpets for boarding in both New York and Chicago. The train contained barber and beauty shops, and a cocktail was named in its honour. The train was so well known that it formed the backdrop for theatre and film. It was the setting for the Broadway musical, “On the Twentieth Century,” which was based on a play. It was later turned into a film called “Twentieth Century.” Alfred Hitchcock’s “North by Northwest” used the train as a backdrop. Steam locomotives were replaced by diesel in 1945. A decade later, however, the train was in decline and service ended on December 2, 1967. Although the New York Central route north of Lake Erie was not part of its usual service, on occasions when the line was blocked south of the Lake, it is known to have passed through St. Thomas.